Flightline has landed, bringing an aviation-themed bar and dining experience to the north side of the Santa Barbara Airport. Owner Warren Butler worked with local aviation enthusiasts to pack the restaurant with flying memorabilia, and Santa Barbara history features prominently. “We serve wholesome American food for a fair price,” says Butler. That includes, steaks, tri-tip, salads, burgers and pastas, plus cocktails, local craft beers and wine from the enormous wraparound bar. A Tavern for this Time: Don’t let the walls made of reclaimed 19-century New England brick, the ceiling of resurrected Wyoming snow fence, or the gleaming copper bar fool you. Finney’s is a modern tavern built for good times. 18 surprising sharable appetizers, plus pizzas, sandwiches, salads and tacos. Burgers are mixed chuck, brisket and hanger steak sizzled on a flat top. “It gives a nice crisp outside and keeps the juices in,” says owner Greg Finefrock. Vegan alert: The increasingly famous Impossible Burger is sold here! Due Lune brings a true Italian dining experience to the watery end of State Street. Sea views flood through walls of windows, and ocean air scents the big patio. 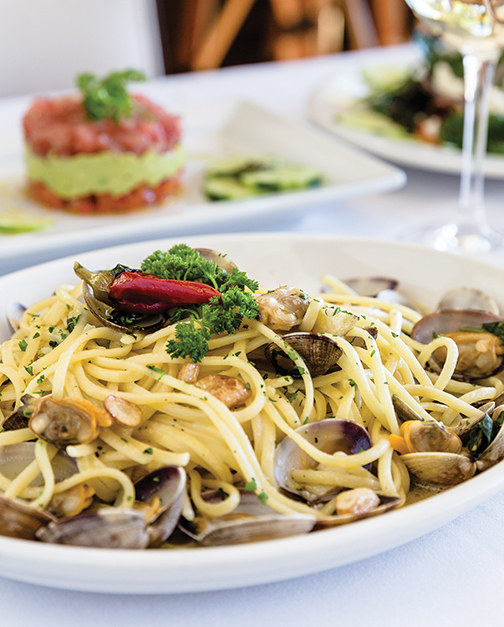 Classic dishes and fantastic local seafood are served with a warm welcome that has made Due Lune a favorite of local Italian expats. The same folks who brought the instant-favorite Empty Bowl Thai noodle shop to the Public Market downtown, have now opened Khao Kaeng in Montecito, where they are serving equally authentic curries and other Thai specialities. Co-owners Jerry Lee and Emre Balli, both sommeliers, are way into pairing wine and beer with the food prepared by adventurous chef and co-owner, Nui Pannak. Fresh ingredients and handmade care - they’re the secret to the home-style Mexican cuisine available at Alito’s downtown. Brothers Eduardo, Victor and Juan Carlos Carranza based the menu on the food their mother used to prepare for them while growing up in Mexico City. There’s a big traditional Sunday brunch also. D’Angelo's is the kind of bakery locals love and visitors are overjoyed to find. Choose a table indoors or out and enjoy freshly baked European-style breads and pastries, great breakfasts and lunches, and strong Italian coffee. Master baker Dietmar Eilbacher does things the same way his father did in his bakery in Bavaria – the honest way, using only simple, real ingredients and no additives or preservatives. Everything from the granola and roasted bell peppers to the jams and artichoke spread is made from scratch. “When you use all-natural raw ingredients and pay attention to the details, you end up with a superior product,” says Eilbacher. French expat restaurateur and partner Fréderic Meschin says that leaving Los Angeles after 35 years to open The Little Door Santa Barbara felt like “coming home.” Like the town between Bordeaux and Cognac where he grew up, Santa Barbara is also a small seaside community that attracts many visitors and has great local wines, tremendous organic produce and easily accessible just-caught seafood. The Little Door Santa Barbara captures the casual, romantic feel of a Belle Epoque restaurant. Soft light that, as Frederic says, “honors the night,” bathes the bar and the dining room in a warm glow. The walls are hung with a collection of drawings and watercolors by Belle Epoque artist Edouard Chimol. Executive Chef Oscar Ledesma offers contemporary-American fare, but includes decidedly French accents and influences from around the Mediterranean, including the Middle East and North Africa. The menu is intentionally compact to reflect what’s freshest and best today at the harbor and the farmers markets. It includes appetizers like charcuterie and California foie gras, fresh mussels and oysters. Entrées include whole local rockfish or chicken baked in the oak-fired oven, grilled local salmon and halibut, an impressive collection of steaks, and delicious, beautifully seasoned vegetarian and lamb couscous. Passionate about service and hospitality, Fréderic and companion Fatos Silan provide a warm welcome while attending to every detail to ensure that The Little Door Santa Barbara opens to a world of deep enjoyment. 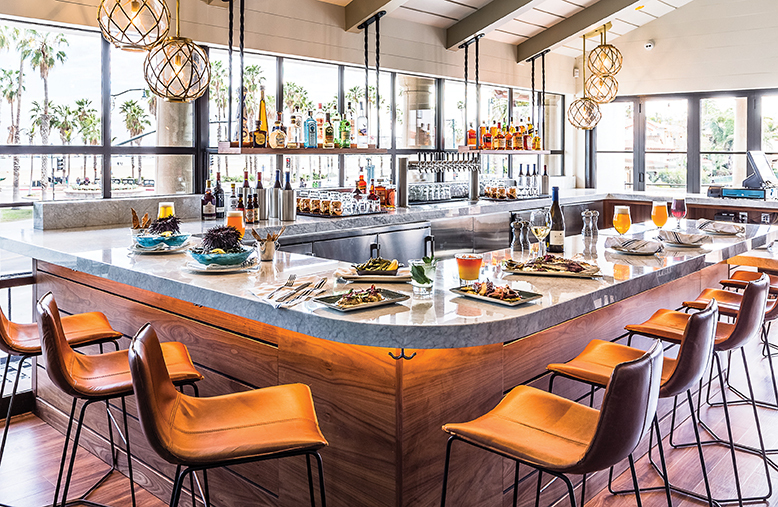 Bluewater Grill is the newest addition to Santa Barbara’s sustainable-fresh-seafood dining scene, and co-founders Richard Staunton and Jimmy Ulcickas are serious about their mission. Staunton works local waters in his fishing boat, the Pilikia, and the restaurant occupies the old lighthouse building that formerly housed legendary Castagnola’s Fish House, which also featured fresh fish caught by their fleet. Bluewater’s seafood is sustainably caught and managed, and the fish-origins chart will tell you exactly where it came from. As for vegetables and produce, think local, seasonal and farmers market. Chef Chanel Ducharme’s kitchen stocks a full raw bar with super-fresh oysters and local sea urchin (uni), whole oven-roasted fish, seasonally available halibut and white seabass; swordfish caught individually from the Pilikia, and a rotating collection of six seasonal specialties including bouillabaisse, seafood paella and New England clambake. At the inspiring and educational Second Tuesday Tastings, Ducharme pairs seasonal seafood with sake, beer or a local wine - the list is a deep dive into the grand cache of great Central Coast seafood accompaniments. It’s all served in the historic building at the foot of State Street, now a beautiful, airy, two-level restaurant with an upstairs bar and outdoor patio that serves up some of Santa Barbara’s best ocean views all day long. Santo Mezcal brings a welcome infusion of first-rate, authentic regional Mexican food to lower State Street. Located next to the Indigo Hotel, on the edge of the Funk Zone, the newest addition to the Los Agaves family of restaurants is a bit more upscale than its siblings, with table service, a modern interior and a full bar fronting a wall of mezcals and tequilas. Santo Mezcal continues the family tradition of great food and friendly service and even shares some menu items, like the kids favorites taquitos and queso fundito. But while more-complex dishes can be challenging in the fast-paced Los Agaves kitchens, here no one minds waiting a couple of minutes while sharing appetizers or one of the signature ceviches with a beer or a house specialty drink in hand. The food is colorful and delicious, with an emphasis on seafood. Try the tacos with grilled octopus, hummus, avocado and pepper oil; the crab enchiladas; any of the moles, or shrimp with a mezcal cream sauce. Whole fish emerge from the oak-burning oven, and there are great deals on rib-eye steak, which is served several ways, including with a cheese-stuffed pasilla pepper, a crab enchilada and beans. Three years ago, Mesa Verde brought a vibrant new world of plant-based cuisine to Cliff Drive. Since then, the casual spot has become a locals’ favorite for delicious vegan food blending vibrant Mediterranean and Middle Eastern flavors. Chef de Cuisine Chris Rayman talks about the need to “build flavor” in vegan dishes, and build he does. Polenta fries come with smoked patty pan squash, white beans, and za’atar, a thyme-based Middle Eastern spice mix with toasted sesame and cumin. Caramelized fried Brussels sprouts team with pickled red onions, pumpkin seeds, fava bean puree, za’atar, sherry vinegar and tamari. Zucchini “pasta” comprises strips of the raw vegetable with warm heirloom tomatoes, oven-dried crimini mushrooms, fresh basil, and Rayman’s macadamia nut ricotta cheese and grated cashew parmesan, plus gluten-free breadcrumbs. Regulars love the cheeseboard - two kinds of nut cheese with condiments such as blackberry-red wine jelly, pickled apples and mustard seeds, local honey, and tamari almonds. The uniquely delicious desserts include a superb baklava. One local forager calls whenever he has a haul of chanterelles, and Rayman turns them into a special, and every week, another local forager delivers a box of edible flowers that adorn a wide variety of dishes. This is food with a firm modern connection to flavor and to good old Mother Earth. Bottlest is a is one-of-a-kind destination offering perhaps the most unique entertainment experience in the Santa Ynez Valley. The Buellton complex houses Santa Barbara County’s largest winery, a critically acclaimed restaurant with modern farm-to-table fare, and a full bar with live music every weekend night. Guests come in to taste wines available from the vast “Wine Wall,” where automated dispensers pour samples and full glasses of 50-plus wines. For those seeking more than wine tasting, Bottlest offers a full bar open, until 11 p.m. on Friday and Saturday and featuring cocktails, pub fare and live music, as well as an upscale dining menu from 5-9 p.m. daily. Here’s a plan: reserve a table in the high-ceiling main dining room with views into the winemaking facility and the display kitchen. Join friends for a guided tour of the winery - you’ll begin by creating your own personalized bottle of wine, followed by tastings of three reds straight from the barrel and three whites from the stainless steel tanks. Follow that with a three to five-course dinner at Bottlest Bistro. Executive Chef Owen Hanavan turns organic produce and fruits, the freshest seafood, and the finest meats into well-conceived, beautifully presented dishes that let great ingredients shine, but with the right amount of flair. Save room for desserts like the Belgian chocolate rice tart, or California bay leaf ice cream. For years, the oceanfront Padaro Beach Grill has been the family-friendly spot to enjoy delicious, well-made burgers, sandwiches, salads, fish and chips, fish tacos, barbecued tri-tip and more in an unbeatable setting that defines the SoCal lifestyle. Come as you are, order at the counter from the super-reasonably priced menu, find a table on the grass under the palm trees - they all come with ocean, island and mountain views - and wait to be called. Service is fast, and while you enjoy a glass of wine, a mimosa or a draft beer, the kids can hit the big sand play area, then cool down with a smoothie, an ice-cream float or a milkshake made the old-fashioned way. With more than an acre of land, a couple of enormous grills, and a catering service, PBG easily handles all kinds of events, from birthday parties and rehearsal dinners to wedding receptions and corporate outings.